A powered listening center complete with Califone 2395AV boombox, four 2924AVPS stereo headphones and a 4 port stereo jack box. Lightweight, flexible, and easy to set up. Ideal for use in the classroom and library. Boombox: The Music Maker Plus supports phonemic awareness, phonics, comprehension, vocabulary, ELL, ELD and other language learning programs. 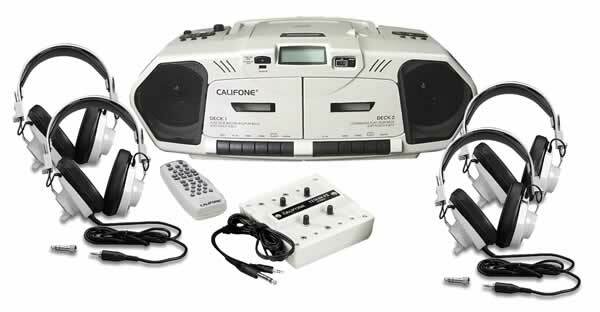 Built for reliability in schools, it delivers classroom flexibility with dual cassette recorder / players, 20 track programmable CD player and AM-FM stereo. Headphones: This durable, stereo headphone is the educator’s standard for multimedia applications, music appreciation classes, listening centers, reading and language learning activities. Its reinforced 6’ cord and 3.5mm plug includes a 1/4”screw-on adapter to makes this a versatile headset and it’s Windows and MAC compatible!